Santi Cazorla scored a goal and created another as Arsenal ended Manchester City's 12-match unbeaten league run and damaged their title hopes. Arsenal added a second after the break when Cazorla's free-kick picked out Olivier Giroud and the France striker headed in from close range. Aguero had only returned from a month out with a knee ligament injury as a substitute in City's 1-1 draw with Everton a week ago, and the Argentina international was relatively subdued by his standards. Chile forward Sanchez, who has scored 12 goals for Arsene Wenger's side this season, was well shackled by the City defence. Instead it was Cazorla, 30, who was the game's outstanding attacking player and it was fitting that he was to have such an influential role with both goals. 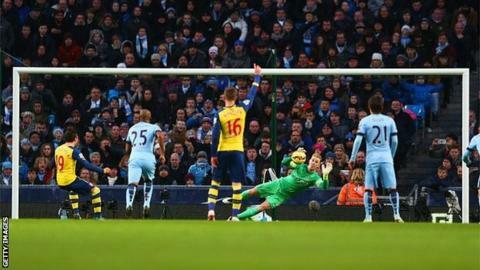 The chance served notice of Arsenal's intent to hit City on the counter-attack and shortly afterwards they won a penalty. Cazorla sent the spot-kick low to Joe Hart's left and even though the City goalkeeper dived the correct way he was unable to get a hand on it. Arsenal packed men behind the ball in the remainder of the first half, which stifled City's creativity with Aguero frequently outnumbered and rarely having the chance to run at players. Despite City's pressure, it was Wenger's side who scored next when Cazorla lifted a free-kick into the penalty area and Giroud escaped his marker and took advantage of a disorganised City defence to head past Hart. Arsenal striker Olivier Giroud has now scored six Premier League goals in this campaign. Match ends, Manchester City 0, Arsenal 2. Second Half ends, Manchester City 0, Arsenal 2. Tomas Rosicky (Arsenal) wins a free kick in the defensive half. Corner, Arsenal. Conceded by Vincent Kompany. Attempt missed. Vincent Kompany (Manchester City) header from the centre of the box is close, but misses to the right. Assisted by David Silva with a cross following a corner. Corner, Manchester City. Conceded by Per Mertesacker. Attempt saved. Edin Dzeko (Manchester City) left footed shot from a difficult angle on the left is saved in the top left corner. Assisted by Gaël Clichy. Corner, Arsenal. Conceded by Frank Lampard. Substitution, Arsenal. Mathieu Flamini replaces Aaron Ramsey. Substitution, Arsenal. Kieran Gibbs replaces Alexis Sánchez. Attempt missed. Tomas Rosicky (Arsenal) right footed shot from the left side of the box is high and wide to the right. Assisted by Olivier Giroud. Corner, Manchester City. Conceded by Francis Coquelin. Attempt blocked. Stevan Jovetic (Manchester City) left footed shot from the centre of the box is blocked. Assisted by Sergio Agüero. Foul by Frank Lampard (Manchester City). Substitution, Manchester City. Edin Dzeko replaces Jesús Navas. Corner, Manchester City. Conceded by Nacho Monreal. Attempt saved. Jesús Navas (Manchester City) right footed shot from the right side of the box is saved in the bottom right corner. Assisted by Frank Lampard. Attempt blocked. Alexis Sánchez (Arsenal) right footed shot from outside the box is blocked. Assisted by Héctor Bellerín. Attempt saved. Alexis Sánchez (Arsenal) right footed shot from outside the box is saved in the bottom right corner. Assisted by Olivier Giroud. Corner, Manchester City. Conceded by Santiago Cazorla. Goal! Manchester City 0, Arsenal 2. Olivier Giroud (Arsenal) header from the centre of the box to the bottom left corner. Assisted by Santiago Cazorla following a set piece situation. Foul by Stevan Jovetic (Manchester City). Substitution, Manchester City. Frank Lampard replaces Fernandinho.